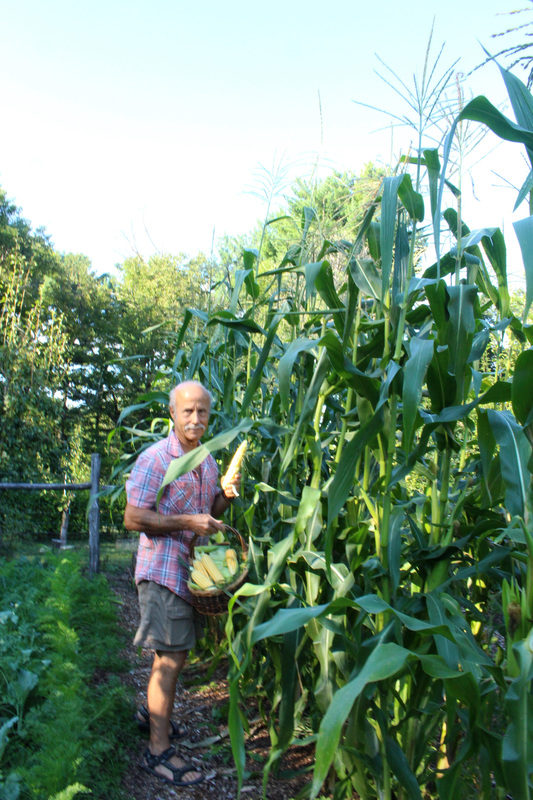 With all the supersweet, tender ears of corn readily available at farms, farmers’ markets, even supermarkets these days, why do I bother to grow my own sweet corn? Because it tastes better, much better. 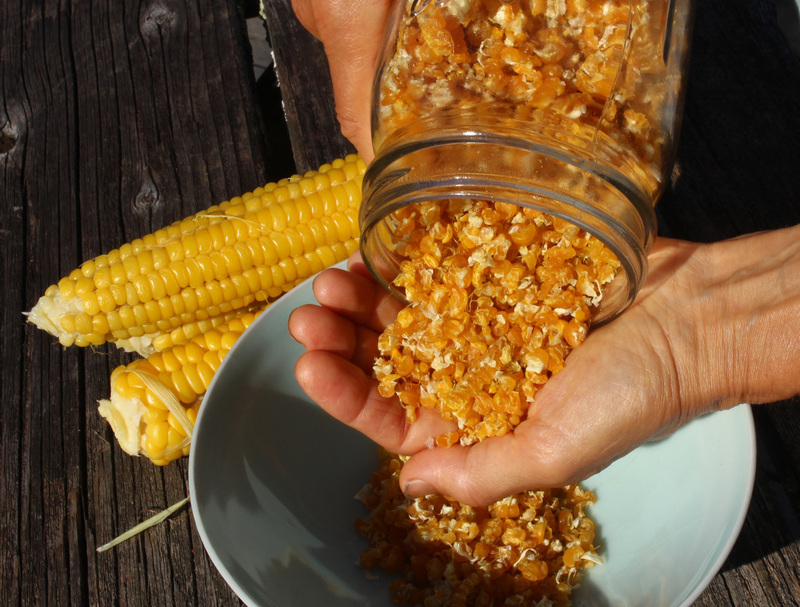 Corn can be too sweet, and too tender for many of us maizophiles. I grow the variety Golden Bantam, which was the standard of excellent in sweet corn a hundred years ago. Its fat, golden kernels are toothsome, giving you something to chew on (but they’re not too chewy), with a rich, corny flavor. And yes, they are also sweet, just not supersweet. Corn is a relatively pest-free vegetable that warrants space in any garden. I grow corn in hills (clusters) of three plants each with 2 feet between hills in the row and two rows of hills down each 3-foot-wide bed. With each stalk yielding one to two ears, I reap 30 to 60 ears for each ten feet of bed! That’s a lot of ears, and it’s in space in which I sow early lettuce or spinach before planting the corn, and late turnips or, again, lettuce, spinach, arugula, or other cool season vegetables to follow the corn harvest. Of course, I plant more than just one 10 foot bed of corn and I spread the harvest season with successive sowings, 4 of them 2 weeks apart. There is one limitation to backyard corn: raccoons. Given the opportunity, they will harvest every ripe ear. Trapping is one way to keep them at bay. My dogs, Sammy and Scooter, spend day and night frolicking outdoors — and convincing raccoons to search for greener pastures. Golden Bantam corn, because it originated in 1906, is, of course non-GMO, that is, a “non genetically modified organism.” (As of now, almost all commercial sweet corn is still non-GMO; just about all field corn, which makes its way into animals, corn syrup, and more packaged products than you can imagine, is GMO.) This is my lead-in to clearing up some basic misconceptions about what GMO means. When the pollen from any plant lands on the female part of a flower of another plant, cross-pollination occurs. The resulting seeds and the plant growing from those seeds carry genes contributed from each of the two parent plants. As a result, the offspring are similar to, but not genetically identical, to the parents. The offspring is a natural hybrid. Enter Homo sapiens . . . Since the dawn of civilization, we humans have sought certain traits in our plants. To get plants with such traits, we chose plant parents having qualities to our liking and deliberately mated them in the hopes that their offspring would pick up only the parents’ good traits. The more offspring that are grown, the better the chance of finding a hybrid — one produced with human assistance, in this case, possessing desirable traits. Besides the crapshoot of traditional breeding, success is further limited by our only being able to choose from among plant parents that are related closely enough to breed. For instance you could not mate a tomato plant, which is not frost tolerant, with, say, a flounder, a fish very tolerant of freezing temperatures, in an effort to make a frost tolerant tomato. Tomatoes and fish are not even distant kin and could never breed with each other under natural conditions. About 30 years ago, scientists developed methods for circumventing the capriciousness of natural or human-assisted breeding. Laboratory methods were developed for teasing a desirable gene out of a cell of one organism, then injecting the gene into cell of another organism to create new organism — a GMO. And I do mean a “new organism,” because it contains genetic material that need not have come from a related organism. That “fish tomato” was, in fact, created by incorporated the so-called antifreeze gene from winter flounder into a tomato. It turns out that gene expression is not as straightforward or as predictable as once imagined. The fish tomato was a commercial flop in its frost tolerance and other agronomic characteristics; perhaps it would have been a good swimmer. Since that fish tomato came and went, other GMOs have been developed. Many have been commercial successes. Just to be clear: While it is true, as is often stated in support of GMOs, that hybridization or cross-breeding has been going on in nature for eons, that cross-breeding has always been between closely related species. Humans intervened, but nature could also have produced those traditional hybrids. All the above involves, in some sense, genetic modification. You are a genetic modification of your parents. But the term “genetically modified organism,” or GMO, genetically engineered, or transgenic organism, signifies an organism that has picked up genes via manipulation in a laboratory, often genes that never could have showed up naturally in the organism. I awaited my first taste of this season’s Golden Bantam with more anticipation than my first taste of tomato. Finally, we’re awash in sweet corn, more than we can eat. But six weeks of sweet corn will not satisfy, so we’re packing away some for winter. Steaming or boiling the shucked cobs arrests enzymes that change kernel’s sugars to starches. With sweetness retained, we slice kernels from cobs, then either freeze them or dry them. Either way, they are a flavorful addition to soups, stews, and breads on dark, cold, winter days. But nothing like biting into a freshly steamed cob in the heat of summer sun. For More, Live . . . This entry was posted in Gardening, Planning, Vegetables and tagged dehydration, genetically modified organism, GMO, sweet corn, transgenic. Bookmark the permalink. Trackbacks are closed, but you can post a comment.